Situated in the recesses of Sredna gora mountain, the museum town of Koprivshtitsa stands at 1060 meters altitude. The two highest peaks in Sredna gora, called Bogdan – 1604 m and Bonayar-1594 m, raise up not far from the town. It has 2600 habitants and is located 112 km southeast of Sofia, 80 km northwest of Plovdiv. In the period of the Turkish yoke Koprivshtitsa was robbed and burnt down by Turkish burglars but the locals rebuilt it three times. The village reached its glory in XIX century when its population was 12000 people. On April 20 1876 the April Rebellion burst out and the first shot fired in Koprivshtitsa. The rich displays in the houses of Todor Kableshkov and Georgi Benkovski tell the story of that glorious time. Koprivshtitsa is unique place, over 300 monuments of the Bulgarian culture from the revival period have been preserved. The old houses have big eaves, stone walls and wide wooden gates. The exterior features windows, shutters, bay- windows painted blue, yellow and red. The house- museum called Oslekova house is the most famous architectural and ethnographic monument in the town. Its owner was a rich merchant from Koprivshtitsa and the house features with its artistic carved ceilings and its walls, painted in beautiful geometrical figures. Famous Bulgarians were born in this town, today their houses are transformed into museums. Among them are the writer Luben Karavelov and the poet Dimcho Debelianov. The first monastery school in the town was opened already in 1810 and in 1846 was founded the first secondary school in Bulgaria. Koprivshtitsa has a reputation of a wealthy village from the period of Bulgarian revival. 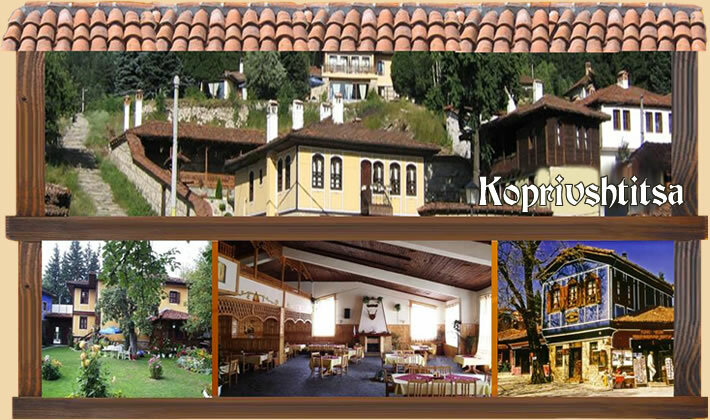 Tourists can find here comfortable family hotels, a lot of taverns-in typical Bulgarian style and many other small and bigger restaurants and hotels.